There is an air of confusion, and even a whiff of crisis, in today’s international art restoration community. At the National Gallery’s CHARISMA symposium on Leonardo’s technical practices and influence (January 13-14), many fascinating and highly informative demonstrations were made of non-invasive imaging techniques. A ground-breaking paper by Ana González Mozo revealed how the Prado’s copy of the Mona Lisa had faithfully tracked Leonardo’s own revisions on the original work. Imagine – a copy not so much of the finished masterpiece but of its very genesis. The proceedings, happily, are to be published. Unfortunately, at this richly rewarding and even-handedly conducted event, two critically serious weaknesses emerged during the proceedings and discussions that seemed linked and together to constitute a wider international art conservation faultline. That is, firstly, there are manifest deficiencies of understanding on the crucial relationship between the discoveries that are being made through advances of technical analysis, and the original painterly/artistic means by which the art-objects-under-investigation were produced by artists in the first place. This single shortcoming carries profound cultural and professional consequences and is, we believe, a root cause of many of the controversies which arise in the field. Secondly, and concerning these controversies, a number of speakers (particularly Italian speakers, as it happens) used their papers to dismiss critics of their (sometimes long-past) restorations. Such combative unrepentance suggests how hard the task remains to establish some proper and effective systems and habits of disinterested critical appraisal in what is becoming an alarmingly expanionist and self-authorising and validating field. Much might be gained if restorer/conservationists themselves would devote more energies to those fruitful knowledge-advancing studies that leave vulnerable and uniquely precious historical works of art intact and free from what too often seem injudicious or debilitating interventions. For some speakers, “virtual” indications of changes within pictures, seemed to be taken in themselves as invitations to swabs-on interventions. Certainly it seemed tactless and provocative when, at a time of great disputation, a Louvre curator, Vincent Delieuvin, ended a talk on non-invasive examinations of the museum’s Leonardo “Virgin of the Rocks” with the bald declaration “Restoration of the painting is possible”. Possible? No doubt it is politically so today at the Louvre, but desirable even under the present controversial circumstances? And what exactly has made this hitherto untreatable picture (see caption at Figs. 2 and 3) treatable? Must every restored masterpiece immediately trigger another? Will curators and their restorers never allow decent intervals for the fumes to evaporate and for their handiwork to be evaluated with due attention and consideration after the inevitable PR media barrages that nowadays accompany all major restorations? For that matter, is no one in authority concerned by the general and wider risks that are being incurred in the current Leonardo binge in which the oeuvre itself is being speculatively “grown” even as its most secure works are being recast by today’s more adventurous generation of technicians? Concerning the Louvre fracas, Didier Rykner, surprised and disappointed us in his Art Tribune post of January 7th by disparaging the international debate on the restoration of Leonardo’s “The Virgin and Child with Saint Anne”, that followed a Guardian report. Headed “A follow-up to the Debate…” that somewhat churlish post afforded a proxy defence of the Louvre’s current policy. Of the momentous resignations of Sègoléne Bergeon Langle, the former director for conservation at the Louvre and France’s national museums, and Jean-Pierre Cuzin, a former director of paintings at the Louvre, from the Louvre’s own international advisory committee, Rykner complains that the restoration has sparked a debate “when in fact nothing new has happened since since the month of October (see our article in French).” One thing that is new is that everyone now knows (thanks to the diligence and reach of the international press) what very few previously appreciated: a profound schism exists over picture restoration methods at one of the world’s greatest museums – in truth, the world’s greatest single museum – and, that the restoration of a major work of the world’s most famous artist is the centre of that dispute. Rykner characterised the “Virgin and Child with St Anne” restoration as one in which only “three points had to be solved”, when, far from being some problem-solving exercise, this is a debate about the very nature and legitimacy of actions that might be made on an immensely complex, unfinished, ancient and precious masterpiece. Restorations never take place in antiseptic clinical spaces. They always reflect philosophies, interests and professional inclinations or dis-inclinations towards radical interventions. Conflicts in this arena are far from trivial and it is desirable that they should not take place in the dark. Not heeded, perhaps, but widely noted nonetheless. The debate that has been opened by the two Louvre resignations shows no sign of abating. In a recent article Bergeon Langle has further explained: “I deemed that the restoration was not being carried out in line with what I imagined was necessary for this Louvre painting. That is my firm belief.” We now learn through such increasingly frequent press reports and the assorted leaks and briefings on this schismatic dispute within the museum’s twenty members strong advisory committee, that the Louvre’s present curators, with the encouragement of certain English and Italian curator and conservator members of that committee, are resolved to pursue more radical, less precautionary treatments. 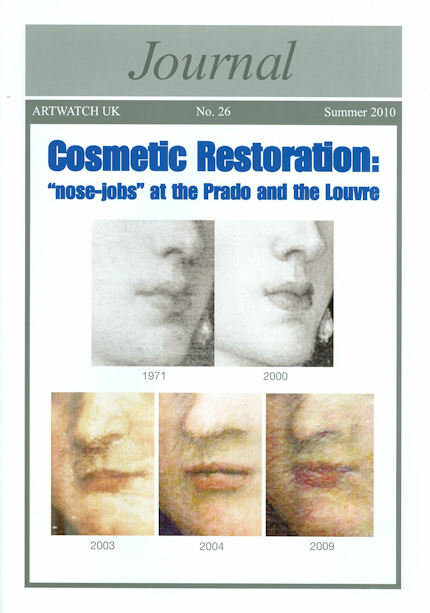 What makes this dispute-among-experts so alarming is that evidence of the consequences of the shift from caution and physical restraint within the Louvre already exists – we don’t have to read the book (and the official accounts, should they ever be made available), we can simply look at the pictures: as previously shown, restorers at the museum may now change and then re-change the expressions on old master faces without even being required to record their adulterations in the museum’s dossiers. This, by any standards is an already extraordinary and indefensible position. News of the Louvre resignations comes just seven months after the shocking disclosure of its cosmetic facial exercises and at the point where the cleaning of the “St. Anne” is completed and the perilous stage of retouching begins. It so happens that the expression of St. Anne’s mouth is interrupted by a panel join (see Fig. 1) which might provide another temptation for a little cosmetic surgery with the retouching brushes. We were not reassured when the Louvre’s present head of painting, Vincent Pomarede said recently that the retouchings would be “reversible”. “So what?”, we would ask. As shown right (Fig. 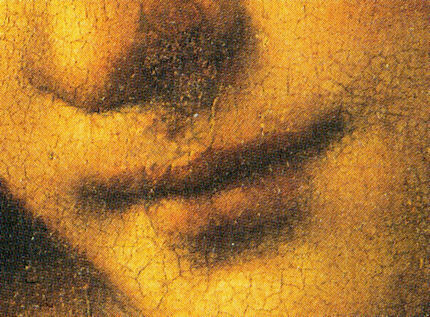 5), the Louvre recently made two egregious errors on a single Veronese face. That the second falsification – which is still in place – is theoretically as removable as the one it superseded does not mitigate the presently persisting offence and lapse of curatorial vigilance. The two members of the Louvre advisory committee from the National Gallery who have been enthusiastic supporters of the current restoration (the then curator Luke Syson, who has moved to the Metropolitan Museum, New York, and the head of conservation, Larry Keith), happen themselves to have been responsible on their own patch for another incomprehensible, initially unacknowledged (- even in the Gallery’s own Technical Bulletin report) but again “reversible” alteration to a (Leonardo) mouth – see Figs. 6, 7 and 8. One of the more monumentally controversial restorations defended at the National Gallery symposium was that of Leonardo’s “Last Supper” by Pinin Brambilla Barcilon. Sponsored by the Olivetti corporation, the restoration had been directed by the distinguished Leonardo scholar Pietro Marani, who is a member of the Louvre’s “St. Anne” advisory committee, and like Syson and Keith an enthusiastic supporter of the present restoration. When we pointed out at the conference that the previous restoration of the “Last Supper” in the 1950s had been praised at the time by Bernard Berenson as an ultimate recovery of all the surviving authentic Leonardo paintwork, Pietro Marani countered by claiming a right for each generation’s restorers and curators to impose their own values and interpretations on historic works of art. The consequences for Leonardo’s “Last Supper” of the claimed (“Buggins’ Turn”?) right to undo and redo every great work of art, will be examined in our next post. Above, Fig. 1: St. Anne, detail from Leonardo’s “Virgin and Child with St. Anne”. The vertical line that runs through the right-hand end of the mouth marks a split in the panel. Above, Fig. 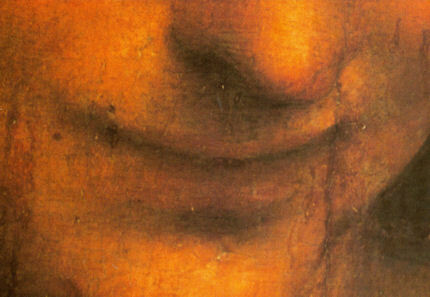 2: Detail of the face of the angel in the Louvre’s version of Leonardo da Vinci’s “Virgin of the Rocks”. 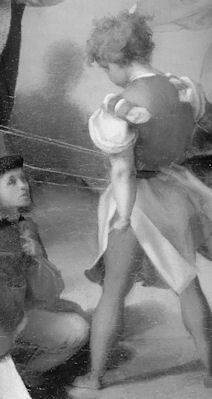 The heavy craquelure is, in part, a likely exacerbating consequence of the paint film having been (badly) transferred from panel to canvas by restorers at the Louvre in 1806. In any event, the persisting fragility and vulnerability of this surface has hitherto protected the painting from “restorations”, of which the National Gallery version of this painting (see Figs. 6, 7 and 8) has had two since the Second World War. It seems to be being claimed now that scientific tests have shown that the painting can safely be restored. Given a) the extremely cracked and irregular surface; and, b) the extraordinary subtlety of the modelling that attaches to the individual fragments of the paint but works artistically across them and despite their physical and optical disruptions, it is hard to imagine what assurances “scientific analyses” might offer in support of taking the sheer risk of working upon such a painting with solvents which are notoriously invasive and pentrating and love nothing better than a good crack through which to advance themselves. Would a restorer attempt to clean each item of paintwork individually or work across several at a time while attempting to preserve the immeasurably subtle artistic relationships that would be out of sight underneath the solvent-laden and abrasive swab? Above, Fig. 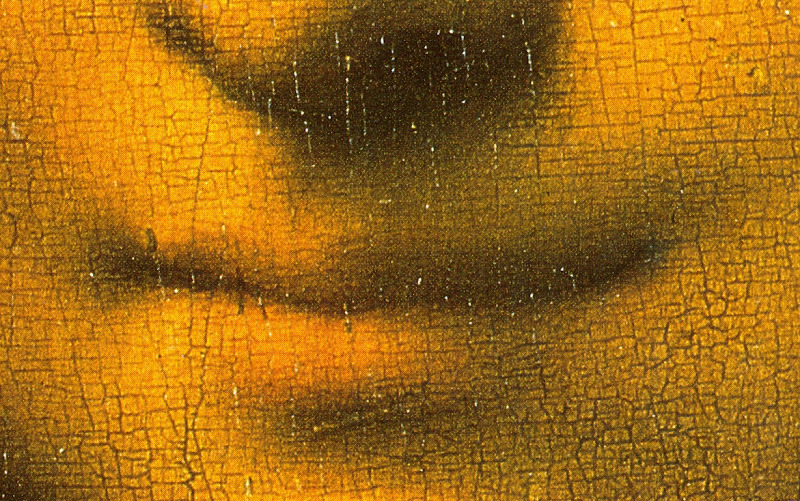 3: Detail of the face of the Virgin in the Louvre’s version of Leonardo da Vinci’s “Virgin of the Rocks”. 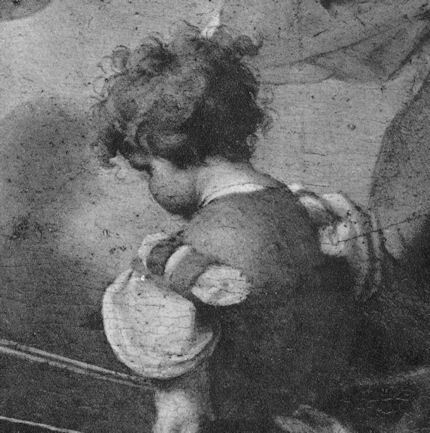 The scholar of Leonardo’s painting techniques, Jacques Franck, has adduced that the “vaporous” subtlety of expression encountered here could only have been produced by minute touches of brushwork applied in multiple glaze layers, and has warned that with such a blur of superimposed micro-layers of vulnerable glazes, one could not be sure that the solvent used, even in the course of a very gentle cleaning, would not cause inevitable damage, whether in the ultra delicate zone of the mouth or elsewhere. As it is, any gum-bound pinks have long since faded or perished at restorers’ hands, along with the Mona Lisa’s eyebrows – which have survived on the Prado’s copy. Above, Fig. 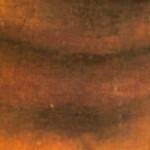 5: The top two images show changes made to the mouth and nose of a Titian at the Prado. 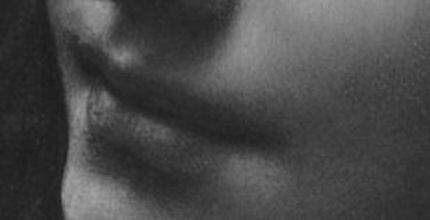 Among the many solecisms introduced in this single “restoration”, the tip of the nose now terminates not in the centre of the philtrum (the groove that runs from the upper lip), as human anatomy decrees, but behind its far edge, in a quasi-cubist manner; the lower lip has been padded-out so as to swing entirely in a convex curve to the left terminus of the mouth; that terminus now sports two little creases, not one, thereby suggesting that the mouth turns both up and down. The bottom three images show the recent changes made to a Veronese face at the Louvre that were detected and reported by Michel Favre-Felix of ARIPA. Above, Fig. 6: Detail of the face of the angel in the National Gallery “Virgin of the Rocks”, above, after its recent cleaning but before retouching. Below, Fig. 7, below, the angel after its recent cleaning and retouching, in which the far side of the mouth was turned down against art historical and technical (including x-ray) evidence. Above, Fig. 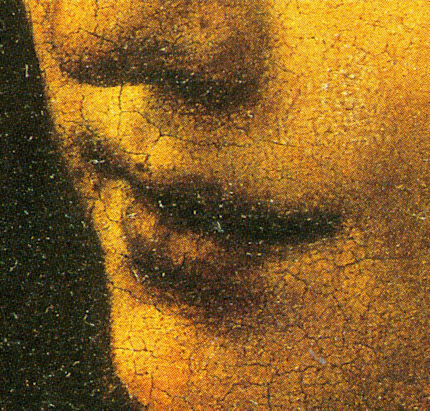 8: Changes made to the mouth and nose tip of the angel in the National Gallery’s “Virgin of the Rocks” in the course of two restorations. Above, Fig. 9, and below, Fig. 10: Details from the National Gallery’s Pontormo “Joseph with Jacob in Egypt”, before (left, and top), and after two cleanings and restorations (right, and bottom). These images are taken from the 1938 and 1990 editions of Kenneth Clark’s book “One Hundred Details from Pictures in the National Gallery”. 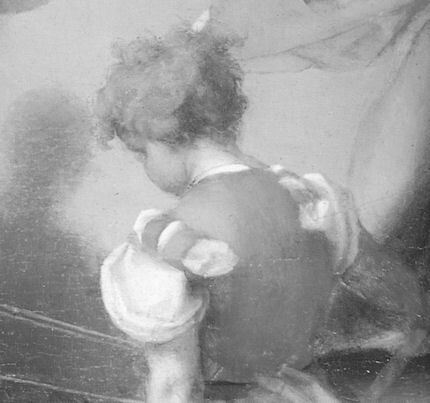 In between the two photographs (the post-cleanings photographs are grey-scale conversions from the large colour plate in the 1990 edition) this painting was restored twice by the Gallery, in 1940 and in 1981-82. It was said of the first cleaning that it had been undertaken because the picture was “much disfigured by dark spots and discoloured varnish”. It should be said that we are greatly indebted to the National Gallery for making its conservation records and photographs available to us. In this particular case, in setting out the post, we queried our own scanned post-cleaning photographs and re-scanned them as a precaution. The second scan was identical to the first. Thus, in so far as the (Gallery’s own published) photographs are reliable, the viewer may fairly make here an appraisal of the artistic cost (in terms of lost tonal differences; lost modelling of forms; lost details – as in curls of hair, for example) that was paid for the removal of the disfigurement represented by spots of darkened retouching. Moreover, such trade-offs, which are surprisingly common in museum restorations, are rarely strictly necessary – or necessary at all. Jean-Pierre Cuzin, the former director of paintings at the Louvre who resigned from the St Anne advisory committee, was of the opinion that the discoloured touches on the St Anne could simply have been repainted. (The varnish had been thinned, replenished and regenerated on a number of occasions since the war.) Such retouching practices are common: aside from its two major cleanings and restorations, this Pontormo had simply been retouched in 1955 – and again in 1979, just two years before its second cleaning.